John Deere has been manufacturing excavators for more than 40 years. Responding to customer demand for excavating equipment that can fit in small spaces, without sacrificing the power of larger-scale models, John Deere introduced its first line of compact excavators in 1986. Over the years, the company has worked to improve the muscle, control and productivity in each new model. 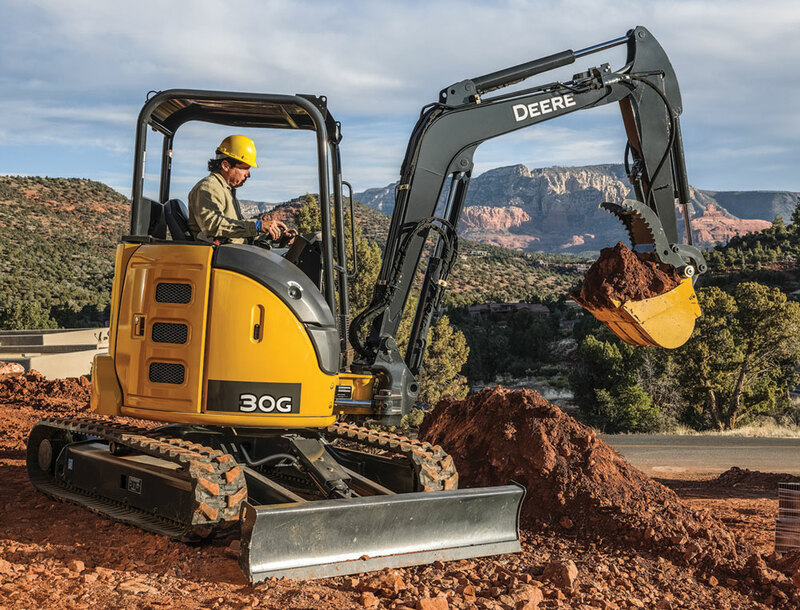 With more than two dozen models that have evolved over the years as a result of direct customer feedback, John Deere’s current compact excavator lineup includes the 17G, 26G, 30G, 35G, 50G and 60G, allowing you to choose the size and horsepower you need to get the job done. Their compact sizes and reduced tail swing designs enable these small but mighty machines to specialize in close-quarters work. The highly fuel-efficient, EPA Tier 4 Final/EU Stage IV direct-injected diesel engines are noticeably quiet so you can put them to work almost anywhere, anytime. There are also many optional Worksite Pro attachments, including rakes, breakers and augers, which can make a sizeable impact on versatility. New to the John Deere lineup, the 30G fills a portfolio gap for customers looking for a solution in the 3- to 4-metric-ton class. The 30G is equipped with all the standard G-Series features customers have come to expect, including mechanical pattern changers, quick-couplers and proportional auxiliary hydraulics. Boosting operator comfort, the new compact model features a redesigned cab with heat and air conditioning, a new seat with adjustable wrist rests for day-long comfort and foldable travel pedals to maximize foot room. The 17G, the smallest in the G Series, has a retractable undercarriage that enables it to squeeze through narrow openings for mechanized muscle in places where shovels used to be the only option. On all models, ergonomic, low-effort pilot controls allow operators to easily maneuver the arm exactly where it needs to be. Need to reach further? An optional long arm allows operators to do just that. A zero tail swing design allows Deere’s compact excavators to rotate fully without banging a tail into something. Combined with independent swing boom and 360-degree rotation, they can slip into close quarters comfortably and work with ease around obstacles. John Deere’s largest compact excavator, the 60G, is just right for landscaping, underground, utility or site development work. Like other compacts, it excels in close quarters and is easy to trailer. But with its dig forces, digging depth and comfortable cab, it produces and feels more like a small mid-size excavator.